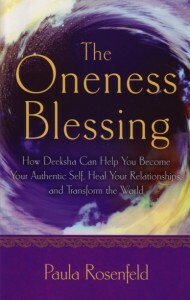 The global phenomenon of the Oneness Blessing, also known as Deeksha, is a non-denominational transfer of energy from one person to another. Deeksha works in a neurobiological way, activating the frontal lobes of the brain and deactivating the parietal lobes. This subtle but powerful shift in brain function supports an experience of interconnectivity, awareness, authenticity and bliss. Rosenfeld interviews trainers whose lives have been transformed through Deeksha. Their humor, gratitude, insights and inspiration intimately illuminate what it means to live an awakened life. You will discover how Deeksha can catalyze a change in inner perception. This can result in miraculous shifts in relationships; prosperity, health, purpose and joy; a letting go of resistance; relief from cravings and addictions; and a shift in brain function that opens the heart, quiets the chattering mind and lets one be fully alive. $14.99 — New Page Books, a division of Career Press, 220 W. Parkway, Unit 12, Pompton Plains, NJ 07444.